Benefits of Phytochemicals – Eat the Rainbow! 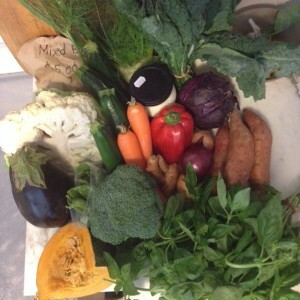 My vegetable rainbow market day haul! We all know we should eat fruit and veg, because of their vitamins and minerals and fibre and so on, but have you heard about phytochemicals? Phytochemicals, or phytonutrients, are naturally occurring chemicals that give plants their colour, flavour and aroma. They are produced by the plants in order for them to grow, reproduce, protect themselves and many other biological functions. Phytochemicals are not classed as “essential nutrients” but research has shown that they can strengthen our immune system, help fight cancer and diabetes, support healthy aging and repair DNA. Rather handily, phytochemicals can be grouped according to colour and function. So, as you will see below, red fruit and veg contain particular phytochemicals that have particular properties, same for orange, green, and so on. How do we reap get the benefits? Pretty easy really, just make sure you eat a range of different coloured fruit and veg each day (making sure you don’t miss any colours out!) to get all the phytochemicals you need to be well and strong. Whilst we don’t yet know how the phytochemicals work, we do know that they work best when consumed in whole foods (with the exception of lycopene, found in tomatoes in greater quantities when cooked – there’s always one!). So, grab your fruit and veg, and eat the rainbow!